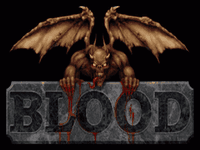 Blood is a first-person-shooter developed by Monolith utilizing the Build engine; the game engine developed by 3D Realms for Duke Nukem 3D. Set in 1928, the player takes on the role of Caleb, a recently risen-from-the-dead gunfighter, whose mission is to seeks destruction of a mysterious cult known as "The Cabal". The game is notable for its high level of gore and unusual weaponry; players are able to decapitate enemies using a pitchfork, while other weapons include a voodoo doll and napalm launcher.